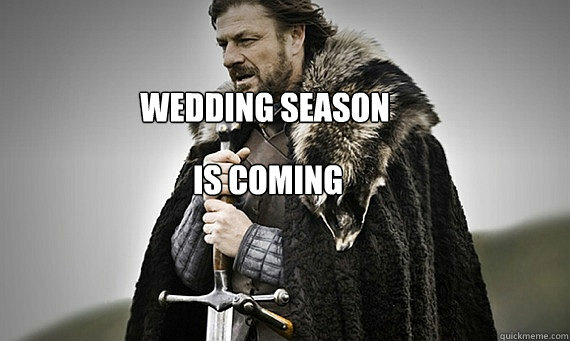 It is FRIDAY, friends and… WEDDING SEASON IS COMING, Y’ALL! I’m giggling a little bit as I write this post partly because I feel a little bit like this meme but also because I am just SO excited! I have the opportunity to work with so many sweet couples this year, and goodness… that is the biggest honor! The countdown to wedding season is officially ON, and I’m literally counting down the days ’til I get to celebrate with my 2019 couples! I’ve missed having a camera in hand every weekend, but even more than that, I’ve missed having the chance to love on and serve each #CKPCouple. I’m someone that loves to plan and that loves to plan well in advance. With all of the excitement about wedding season though, I found that I had a little bit of anxiety about diving right back into the grind. Jumping back into busy season can be a little bit jarring, especially if you haven’t planned and prepped in advance. I learned this the hard way last year, jumping into a busy season that didn’t end until December, just days after I left my full-time job at the end of March! This year, I took a look at what I wished that I had done before last year’s busy season kicked off, and I made a list. I’m sharing it with you today in hopes that it helps you prep for your own busy wedding season! Do I plan on doing everything on this list? Nope! (I’m going to try to do as many as possible though!) Do I expect you to do everything on this list? Absolutely not! That would be a lot to ask… What I do hope you gain from this post is a bit of inspiration and maybe a little spark in motivation as we gear up to serve our sweet clients this year! If you are sharing the same anxieties that I have about taking on the busier season, I hope this list helps to give you some (fun) concrete ways to prepare! Check and organize your memory cards and batteries… buy new ones if necessary! Think: camera straps, bags, cleaning accessories, card readers, chargers, laptop cords, cases, favorite morning coffee travel mug, restock your “emergency kit,” etc. Test your flashes, triggers, and receivers… make sure everything is still in working order! While we’re at it, if you use rechargeables for your flashes and triggers, check those batteries too! Check in on your hard drives and backup system… make sure everything is in working order and has plenty of storage. Adjust accordingly, if needed! Maybe treat yourself to a mani/pedi, massage, or bubble bath?! Start incorporating some light workouts, healthy snacks & additional water into your daily routine… we all know how you can feel a bit like you got hit by a bus the morning after your first wedding back. This will help! Bonus points? Begin to establish a personal routine that gets you OUT of the house! Take a walk… meet up with a friend to take a fitness class… something to get you out, moving and breathing fresh air at least a few times a week! Make it a mandatory task on the days where editing is your biz priority. Bonus tip here: Make your wedding season “roster” to share with the people you love! Include a list of each date, couples name, venue, and second photographer/assistant contact information. You never know when this information could be valuable while planning life or, in the worst case scenario, in the case of an emergency. I’m trying Rothy’s this season for the very first time! Updates to come on if I love them! Click here to receive $20 off your order. What time will you start work? What time will you end work? When will you turn your screens off at the end of the day? This one sounds a little crazy, but it doesn’t hurt: If you have the time & the resources, schedule a headshot session or set up a headshot swap with a friend. Having a little extra personal content for social media and your website when you seem to be living life behind the computer in sweats is always a blessing!